Cosequin for Dogs is a nutritional supplement that helps dogs maintain healthy joints. Cosequin for Dogs is a nutritional supplement that helps dogs maintain healthy joints. It has been rated the number one veterinarian-recommended joint health supplement brand. Cosequin's active ingredients include glucosamine and chondroitin, and it can have a positive impact on joint health, while avoiding the side effects that can sometimes accompany prescription drugs. It is available in regular strength capsules and regular strength and double strength capsules and chewable tablets. 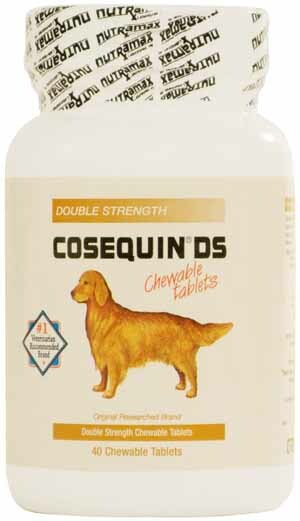 Cosequin for Dogs is available in capsules and DS chewable tabs.